There’s certainly no shortage of adventure games on the PC, though unlike first person shooters or strategy games, the genre seems to come in and out of fashion. This particular adventure title reinvigorated interest in the genre when it was released in 2003, receiving widely positive reviews from the media and players alike. The game has aged well since its release and fans of more cerebral puzzle solving will find plenty to enjoy here as they follow George and Nico across the world, uncovering the sinister secrets of the Sleeping Dragon. 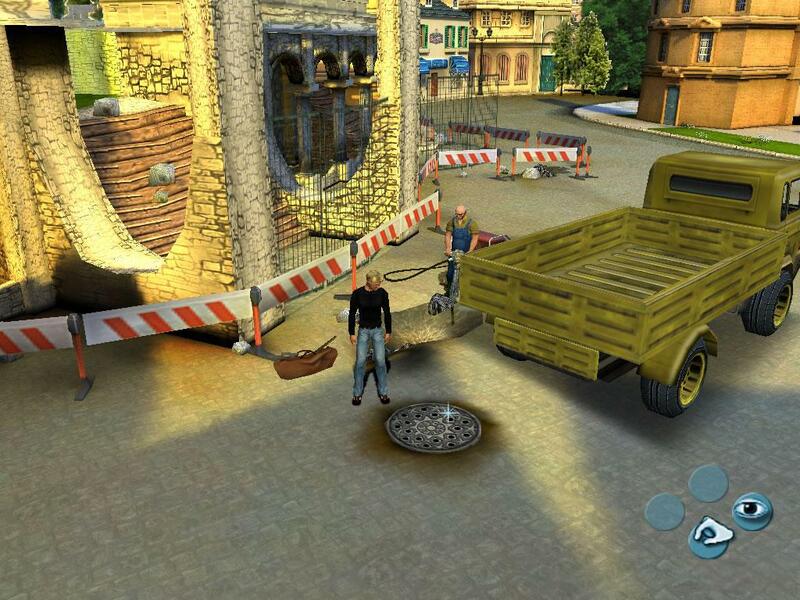 Broken Sword 3 should install without too many issues on a modern PC. The original CD copy of the game does feature a copy protection mechanism that can cause issues on certain PCs. When you first insert the CD, be prepared to wait a moment while the installer starts. During the installation process, you may see a window for “LCore.exe” stating that the wrong volume is inserted. Ignore this message until installation is complete (you should be able to move it out of the way if it is obscuring something on your screen). At the end of the installation process, you will be prompted to re-insert the first game CD, at which point you should be able to dismiss the “LCore.exe” window as it will be able to find the correct CD. No patches or compatibility options are required for the game, so simply start it from your Start screen or Start menu. If you’re using the retail CD version of the game, then every time you come to play you should ensure that disc 1 is in you computers optical drive before you start the game from its shortcut. There’s just one option for Broken Sword 3 relating to visual quality and that is the screen resolution setting. You can access this setting by starting the game, then selecting “Options Menu” and then “Graphics Menu”. The game will allow you to choose almost any screen mode your monitor supports, but there are some things to keep in mind. First of all, on a modern PC you should always choose a screen mode with a 32 bit colour depth. These can be identified by looking for the “X32” on the end of the screen mode (e.g 1024.x768x32). Secondly, although you can choose widescreen resolutions if you want to, keep in mind the games graphics were designed for 4:3 aspect ratio (non-widescreen) monitors, so you’re strongly advised to choose a mode such as 1280x1024x32 or 1024x768x32 rather than a widescreen mode since the graphics will appear stretched out of proportion in widescreen. The games “Action map” maps perfectly to the Xbox 360 controllers face buttons. Broken Sword 3 supports both gamepads and keyboard controls. Unlike many other adventure titles, you move your character using either the controller or the keyboard, not by pointing and clicking with the mouse. The game has an “Action Map” at the bottom of the screen with icons indicating what you can do in any given context. These icons are laid out in the same positions as the buttons on the Xbox 360 controller, so mapping those buttons to the action map makes the game super easy to play. You can do this from the games main menu by choosing “Options Menu” and then “Controls Menu”. In this configuration, you can also use the Y button to go back when navigating the games menus. It’s not all plain sailing for joypad users however, since the game cannot recognise the analogue triggers on the Xbox 360 controller. Ideally these controls should be assigned to sneak (left control) and run (left shift). To do this, we can use our old friend Xpadder again. 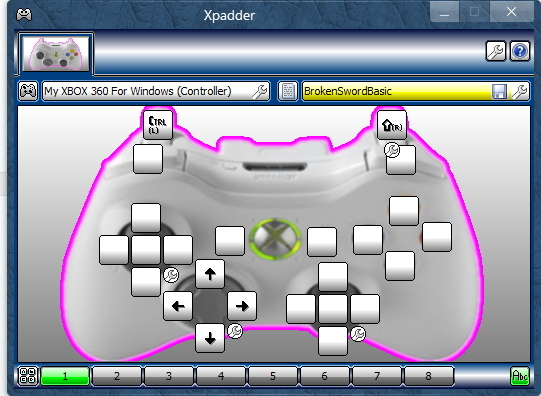 See the picture below for our Xpadder profile. As simple as it gets, we assigned the left control and left shift keys to the analogue triggers, allowing for us to sneak or run in the game by holding them down. We also assigned the arrow keys to the d-pad just because it makes navigating menus a little easier. All other controls can be configured in the game itself. Your other option is to configure a distance zone, that will make George or Nico run when the control stick is pushed sufficiently. We used this technique in Grim Fandango and you can see a tutorial on distance zones here. We don’t recommend trying to create a distance zone for sneaking, since it is necessary to be in sneak mode but standing still during key parts of the game. Unable to authenticate disc within time limit – This error occurs due to problems with the copy protection. To work around it, make sure to insert Broken Sword Disc 1 before you start the game from the Start menu or Start screen. Alternatively, a DRM free copy can be purchased from GoG.com. Problems saving games and configurations – Like many old titles, Broken Sword 3 saves its game data into the same folder as the game itself. In some instances on more modern versions of Windows, this will mean that save games and configuration files cannot be written. To solve this problem you can either run the game as administrator (right click on the games icon and choose “Run as administrator”) or, better still, set the permissions on your game folder so that your user account has full control/read write permissions. You can find a tutorial on how to configure folder permissions here. The games default installation directory is “C:\Program Files (x86)\THQ\Broken Sword – The Sleeping Dragon”. The actual save game files are stored in the “saves” sub directory and are named “0.bss”, “1.bss” etc. Nico chats to an eccentric friend.